Do you have an ancestor who was absent without leave from the British military? If so, Fold3’s UK, Military Deserters collection can be a valuable resource for discovering personal details about your ancestor. Starting in 1772, British law enforcement published what would eventually become known as the Police Gazette (sometimes also called the Hue and Cry), which provided information on people wanted for crimes. Every two weeks, the Police Gazette included a list of men absent without leave from the various branches of the British military; these lists are what are included in Fold3’s collection. 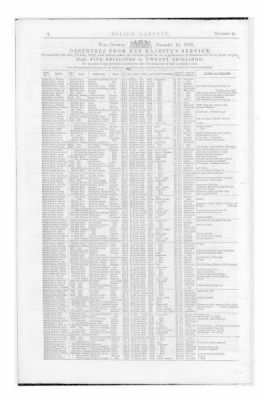 Fold3’s UK, Military Deserters collection includes desertion lists from 1812-1901 and from 1921-1927. Although not every list from within these time periods is available, there are still more than 300,000 pages of information about British deserters, stragglers, and absentees. The types of information provided in the desertion lists varied over the years but was always fairly specific, as it was meant to help the authorities identify the deserters based on the description alone. In addition to including essentials like name, age, regiment and corps information, and date and place of desertion, the lists also included physical descriptions that ranged from the basics (such as height, hair color, and eye color) to specifics (like descriptions of the person’s eyebrows, neck, nose, mouth, feet, complexion, identifying marks, clothes, and more). Also commonly included were the person’s place of origin, trade, and any other bits of information that would aid in identification. For example, a desertion list from June 1828 identifies as a deserter 21-year-old Valentine Carmody of the 15th Foot, who was born in Thornougate parish in Limerick county and was a clerk before enlisting. Carmody is described as being 5’7″ and slender, with a “regular” head, oval face, grey eyes, brown eyebrows, short nose, short neck, and dark brown hair. Another list, this time from November 1875 describes John Read, age 28 ½, from Lambeth, Surrey. Read deserted 8 October in Woolwich from the Royal Artillery and had been a laborer before enlisting. He was 5’10¾” with dark brown hair, grey eyes, a “fresh” face, and a scar on his forehead and the back of his right hand. He was last seen wearing his regimental uniform. The lists also sometimes identify men who had been dishonorably discharged, as well as those who had previously been listed as deserters but who had since either rejoined their regiment or were no longer to be apprehended for some other reason. There’s a lot of interesting information to be found in Fold3’s UK, Military Deserters collection! Get started searching or browsing here. Is there a list of UK soldiers that fought during the Revolutionary War? Any lists of Hessian soldiers who deserted during the Revolutionary War? What happened to 1902-1920? My great uncle, an Australian stationed in France during WWI, went AWOL at the end of a leave in England spent visiting relatives. He returned to service fairly quickly. Maryland. The British Army put a reward for his capture, but he lived free. Would there be a list of English soldiers serving in Ireland around the early 1800’s? If you have premium membership on Ancestry UK, you should already have access to all British and Irish records. You should not have to pay again for access to Fold3 documents. This is totally wrong! Take information which is readily available in the public domain and charge people for access to it. Forgive my ignorance. Where would I find these records for free? I paid $10 for “Brunswick Deserter-Immigrants”. I have an extra copy of the other publication and would be happy to send it to you if I had a snailmail address. Anyone named “Uffington” from Oxfordshire?